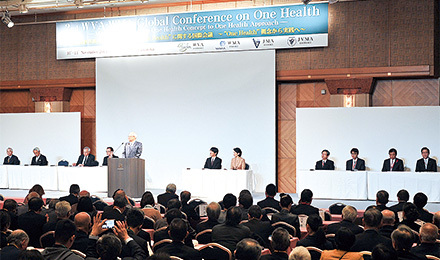 JMA and the Council of Four Hospital Organizations together requested to postpone the launch of the "New Medical Specialist System"
The 137th Regular General Assembly of the Japan Medical Association (JMA) House of Delegates was held on June 25, 2016. Dr. Yokokura was re-elected for a third term as the JMA President. Drs. Umeyo Yunokawa, Tomohiro Ichikawa, and Kichiro Matsumoto joined the board as new Executive Board Members. In his policy address, Dr. Yokokura presented "community development," "human resource development," and "organizational development" as his main policies for his third term in office. 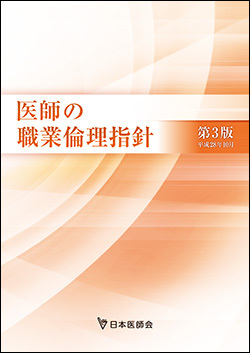 In anticipation of a further declining birthrate and aging society, the JMA Kakaritsuke Physicians Training Program began in April, 2016 with the aim of evaluating the ideal framework of Kakaritsuke Physicians' functions, which will help build more confidence from local communities, as well as maintaining and enhancing the competence of Kakaritsuke Physicians. 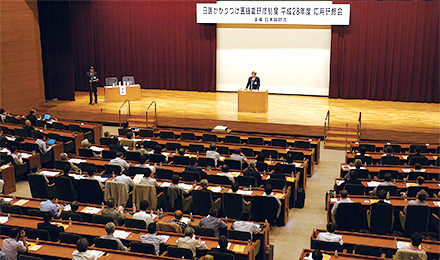 The program will be operated mainly by prefectural medical associations. Over 6,000 physicians (including teleconference participants) joined the advanced training workshop, which was held on May 22, 2016 at the JMA Building Auditorium. 3. JMA and the Council of Four Hospital Organizations together requested to postpone the launch of the "New Medical Specialist System"
As several communities have raised concerns about the "New Medical Specialist System" that was scheduled to start from April 2017, President Yokokura and the presidents of the members of the Council of Four Hospital Organizations held an urgent joint press conference on June 7, 2016 and insisted that "the launch should be reconsidered for now in order to listen more to the various opinions of parties involved to prevent community health from deteriorating." In response to this statement, the Japanese Medical Specialty Board decided to postpone the launch of the new system for a year until April 2018. In keeping with the internal review submitted by the JMA Committee for the Ethics and Quality Improvement of Members, the JMA Guidelines for Physician's Professional Ethics was revised for the first time in 8 years and a third edition was published. The guidelines have been revised generally—for example, a new item on "issues relating to genes" was added, and "the Revised Act on the Protection of Personal Information" and "the Medical Accident Investigation System" are also mentioned. President Yokokura announced the "JMA 2016 Declaration of IT Development," which was compiled in response to the reports by the JMA Medical IT Committee, at the regular press conference on June 8, 2016. Dr. Yokokura indicated that, based on this declaration, further efforts will be made for IT development in the field of healthcare. Unlike the previous declaration, the scope of which stayed within the promotion of ORCA projects, the new declaration consists of five items and comprehensively covers IT policy within the field of healthcare. The compensation plans for the JMA Liability Insurance System were expanded starting July 1, 2016. This expansion aimed to ensure compensation for damages incurred when a JMA member who is working as an industrial or school physician is held legally liable for an unforeseen accident due to his/her professional services. 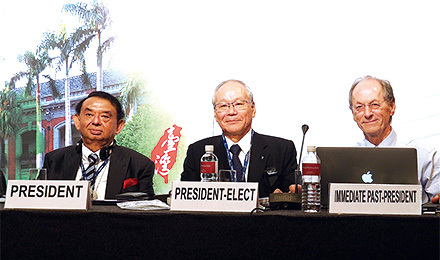 President Yokokura was elected as the President-elect of the World Medical Association (WMA) at the WMA General Assembly in Taipei, which was held from October 19 to 22, 2016 in Taipei, Taiwan. At the press conference held on October 26, he expressed his determination to work on a wide range of issues as the WMA President-elect. Dr. Yokokura will assume the WMA Presidency at the General Assembly in Chicago in October, 2017. In response to the 2016 Kumamoto Earthquake that occurred on April 14, 2016, JMA established the Disaster Management Headquarters the very next day. With the cooperation of JMA members, 568 teams totaling 2,556 members were dispatched under the JMAT (Japan Medical Association Team) program by July 16, 2016. JMA also asked all affiliated medical associations and members nationwide for donations and collected over 470 million yen (approx. 4.08 million USD) , which was allocated to the two prefectural medical associations of Kumamoto and Oita. 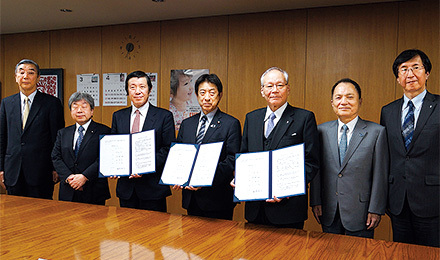 As the increasing number of diabetes patients raises concerns, JMA, the Ministry of Health, Labour and Welfare (MHLW), and the Japan Anti-Diabetes Promotion Council signed the Partnership Agreement Pertaining to the Prevention of Aggravation of Diabetic Nephropathy, in order to promote local efforts for it. 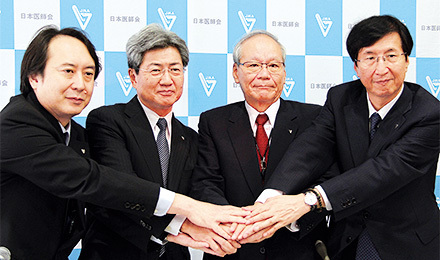 The signing ceremony was held on March 24, 2016 at the Ministerial Office of the MHLW, and President Yokokura and Vice-President Satoshi Imamura attended from JMA. The Second World Veterinary Association (WVA)-WMA Global Conference on One Health was held in Kitakyushu City (Fukuoka, Japan) on November 10 and 11, 2016, hosted by JMA, WVA, WMA, and the Japan Veterinary Medical Association. The opening ceremony was graced by the presence of their Imperial Highnesses Prince and Princess Akishino, followed by a keynote lecture presented by Mr. Koichi Tanaka. On the second day, the Fukuoka Memorandum, which aims to strengthen collaboration between physicians and veterinarians in efforts against zoonotic diseases, was unanimously approved.